Now firmly a staple on the Scottish festivals calendar, Terminal V will once again take over Edinburgh’s Royal Highland Centre for their 11-hour Easter party, The Rising, and as usual the line-up does not disappoint. Heading up the bill, Canadian DJ and producer Richie Hawtin will be making his first appearance in the capital for 18 years, having last performed in Scotland on his experimental live hardware CLOSE tour at Glasgow’s O2 Academy in October. Meanwhile, other line-up highlights include Ukrainian DJ Nastia, Australian young gun Mall Grab, techno mainstay Daniel Avery and Mixmag’s DJ of 2018 Objekt. Edinburgh club Sneaky Pete’s return to the festival to host The Green House, following their stage takeover at Terminal V’s Halloween party last year, with sets from the likes of Derrick Carter, Horse Meat Disco and Young Marco. And making their first appearances at the festival are satirical publication Wunderground, who will present The Rescue Stage, and popular Edinburgh bar Paradise Palms, who bring with them a team of regulars to perform in The Palms Tent. Ahead of their sets at the Easter festival, Berghain resident Tama Sumo and rising techno star Helena Hauff discuss their careers, touring and the ever-changing landscape of dance music. Tama Sumo: As far as I am informed, you started out DJing at Golden Pudel Club [in Hamburg]. When did you start DJing and what was the driving force behind it? Helena Hauff: During my teenage years I would record tonnes of cassette mixtapes, but I properly started DJing in 2009. I got my first decks and my first gig at the Pudel. I really wanted to become a DJ because I liked the idea of free booze in the backstage. I soon got obsessed with turntables and records/music and couldn't and wouldn't wanna do anything else anymore. You’ve played different events around the world. Did you – due to those experiences – ever feel the wish that you maybe want to not only travel but to move somewhere else? If so, where and why? Actually the more I travel the more I appreciate where I live. Especially because you can still smoke inside bars and clubs in Hamburg, which is something I really enjoy. Also, I get to see so many different things and meet so many cool people around the world; it's nice to have a fairly quiet everyday existence when I'm back. It's cool to live in a place where all your friends are and you feel totally at home. What do you do to unwind after a stressful tour/weekend? I sleep and sleep and sleep and then I eat and drink and meet friends and then I sleep again. If you had only one track in your life that you [could] listen to, which one would it be? The Stooges – Gimme Danger. But if there was more time before I finally kicked the bucket I'd listen to the whole album, Raw Power! When you travel, what do you miss the most or what do you look the most forward to when you come back home? 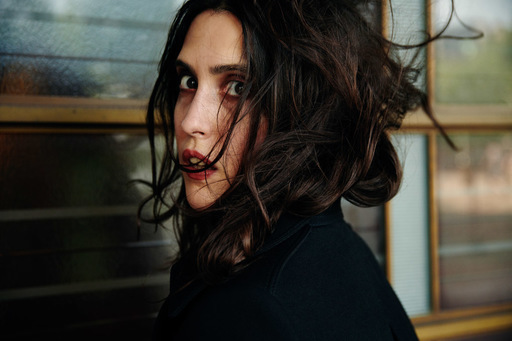 Helena Hauff: What's the best piece of advice you've ever been given? Tama Sumo: [In the] middle of the 90s there was this lovely, creative and, in the best way, crazy guy that did a regular party in Kreuzberg. He asked DJ Clé and myself to be his residents and we were up for it. Before the opening night his request regarding music was kind of: "You have all the freedom to do what you want and feel. You are free to experiment and challenge the crowd. You can go to extremes; just don’t do the average Joe or play safe. The worst thing that could happen would be that people find the party nice." This was in my first years as a DJ and it was great to have a promoter being open and brave and explicitly encouraging you to stay true to yourself and dare to try out things. How long have you been DJing for and what is the biggest difference/change between then and now, positive and/or negative? I have been DJing [for] over 25 years now. Techno and house especially in Europe were still pretty new and, for me, everything felt more innocent in terms of music productions, doing events etc. There was no blueprint for anything and I found this very charming. Now everything feels a bit more analysed, which is not surprising at all. The electronic music scene grew older, and of course a lot has been written about it and discussed, plus on top everything is more widespread nowadays because of the internet. What's the biggest challenge you had to face during your career? My so-called 'career' had ups and downs, which – I guess – is part of the game and it is always a bit of a struggle if something that you love doing is seeing some rainy days. When the old OstGut, Berghain’s forerunner club where I also played quite often, had to close [at the] beginning of 2003, my DJ bookings slowed down and I also was not so inspired by the nightlife in Berlin then. It was a time where I was mainly playing in Berlin. I thought I may have to probably give up DJing. Then rumours started circulating that a new OstGut will probably open, but nobody knew for sure, plus it was also not a given that they would ask me back again. So I was ecstatic when, shortly after the opening of Berghain, I got the phone call from one of the owners to play there again. And, as it later turned out, even on a regular basis as a resident. Do you have a favourite type of gig? (small club, big club, festival) Do you find positives in all of them, and what do you find most challenging? I can find positives in all of them – at the end, a lot depends on the crowd and how things are put together. The perfect gig would probably be in a medium-sized environment, with a crowd from all walks of life, a great sound system and a sensitive thought behind the musical curation. The most challenging thing for me is if I find myself at an event where I have the feeling that neither the crowd and atmosphere nor the music that’s been played has anything to do with me. The challenge then is to stay true to myself and go through it. Luckily that’s not happening too often! And, most importantly, what's your favourite colour? I love red, rather the strong tones and the slightly darker versions.